Welcome! Like the book of the same name, this blog is an eclectic collection of Sherlockian scribblings based on more than a half-century of reading Sherlock Holmes. Please add your own thoughts. You can also follow me on Twitter @DanAndriacco and on my Facebook fan page at Dan Andriacco Mysteries. You might also be interested in my Amazon Author Page. My books are also available at Barnes & Noble and in all main electronic formats including Kindle, Nook, Kobo and iBooks for the iPad. When and how did you first encounter Mr. Sherlock Holmes? It was during the summer when I was allowed to stay up and watch the late show on TV—I was probably about 12, or so—when I first saw the Basil Rathbone series of Sherlock Holmes movies. My older brother informed me that these were updated and that the Holmes of the stories was from an earlier era. He also gave me a paperback book containing a collection of short stories. Craving more Holmes, I bought myself a complete Canon and the thing blossomed from there. You make a wide range of beautiful and creative Sherlockian crafts. How did that come about? I was looking for a way to support my dear friend Jacquelynn Morris with her symposium, Scintillation of Scions, and being somewhat artistic, I came up with the idea to make a Sherlockian charm bracelet for their auction. It was so popular that people were asking me if I made jewelry to sell. One thing led to another and I began selling my creations. The first symposium I ever sold at was in Dayton. I also sell my items on Etsy under the name Artful Pippin. You are speaking at Holmes, Doyle, & Friends Six in Dayton on March 30 about Holmes in the movies, from silent days forward, with clips. That’s a big topic! What’s your particular approach? I have a Power Point presentation that includes pictures from the various movies and TV programs. This will be a very condensed version of my presentation due to the 20-minute time limit. The original presentation included film clips of nearly all the fifty-plus movies I present with a few interesting anecdotes. In this version, I still include a few of my favorite clips and all the movies are still covered, just a bit more briefly. Is that a life-long interest of yours? I would say so. Remember, I was introduced to Holmes through the movies, so I naturally have a fondness for them. How did you come to start the Ribston-Pippins in 1988? And don’t forget to explain the name! Oh yes, the name. We were looking for a name that hadn’t been used before and that sounded interesting. I leafed through Tracy’s Encyclopaedia Sherlockiana when I ran across the term “Ribston-Pippin.” We had a vote at our second meeting and everyone liked that name best. It comes from Watson’s description of one of the men, James Lancaster, who came to interview with “Captain Basil” in “The Adventure of Black Peter.” Subsequently, we acquired a member who actually grew Ribston-pippins in his yard. His chosen nom was “James Lancaster,” of course. To what other Sherlockian groups do you belong? I’m in the BSI, ASH, Hounds of the Baskerville (sic), Amateur Mendicants, Watson’s Tin Box, Illustrious Clients, and Bar of Gold. What has it meant to you over the decades to be part of worldwide community of friends devoted to Sherlock Holmes? I love being a part of this wonderful community! I’ve met a lot of great people and become close friends with many of them. I feel like I’ve found my people! When did you become a member of the Baker Street Irregulars? I was given the investiture of “A Little Ribston-Pippin” in 2006. It was one of the most awesome experiences in my life! I was floating on a cloud for a long time. I’m sincerely honored to be a part of this illustrious organization. What question have I not asked you that you would like to answer? Have you ever had anything of your Sherlockian writings published? Yes! I’ve had two small monographs published in the Baker Street Journal, a short story published in Charles Prepolec’s Curious Incidents II, and essays in About Sixty and Sherlock Holmes is Like. I’ve also contributed a monograph to an upcoming Baker Street Irregulars book, Corporals, Colonels and Commissionaires. Register now for Holmes, Doyle, & Friends and get the early-bird discount. Francis Aloysius Finn, owner of the A-Plus Detective Agency & Famous Detectives School, gets more than he bargained for when Norris Beamer asks Finn to investigate his father's death. Is Viola, Beamer's new step-mother, really a black widow, or did her four elderly husbands die of natural causes? Is one of her neighbors involved? Or her boss? Or someone else . . . With the help of his somewhat wacky Famous Detectives School students and Hilary Kendrake, his temporary secretary, Finn uncovers a deadly scheme of drug-dealing and murder -- but will one of them be another victim? Find out! Small town controversies can be murder. When a newcomer to Erin, Ohio, proposes to tear down the historic Bijou Theater and erect in its place a boutique hotel, Sebastian McCabe adds “civic activist” to a long resume that already includes magician, mystery writer, professor, and amateur sleuth. 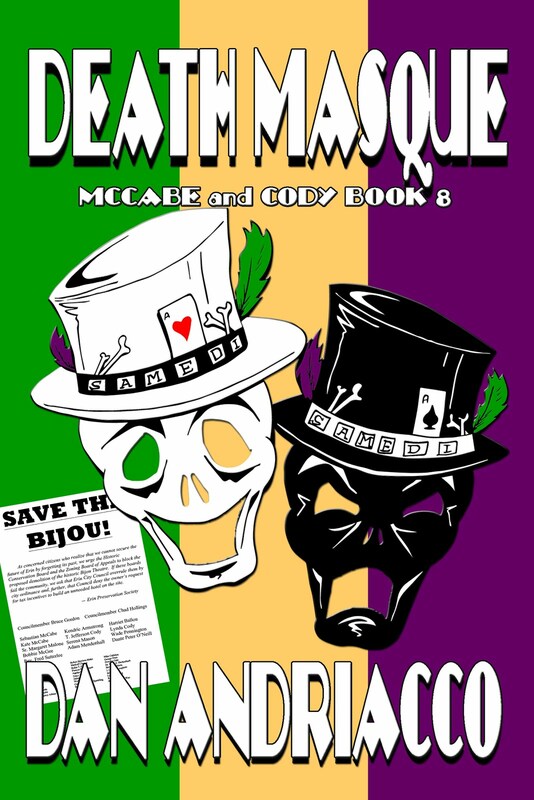 With the strategic help of brother-in-law Jeff Cody, Mac launches a far-reaching campaign to “Save the Bijou.” The issue becomes highly political when three eccentric mayoral candidates stake out their positions – which one of them switches after a hefty campaign contribution. “The plot machinations of grand opera seem positively guileless by comparison!” Mac cries. Can homicide be far behind? The opera comparison is a natural one, for the new Erin Opera Company is staging an original work with a Mardi Gras theme. As murder strikes again, this time back stage, Sebastian McCabe becomes aware that many of the actors in this real-life drama are wearing metaphorical masks as well. Lynda Teal, Jeff’s wife, records much of Mac’s sleuthing for a podcast series, never imagining that the most dramatic audio of the concluding episode will come from the murderer. Buy it now! 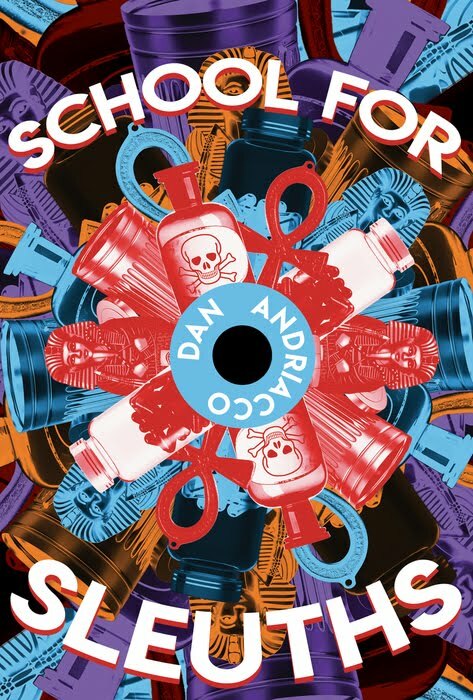 Dan Andriacco is well established as a formidable detective story writer and (no great surprise) as a formidable Sherlockian. It was only a matter of time before he turned his hand to a full-length and full-blooded exploit of the sage of Baker Street – and what a cracker it is! Shortly after the Queen’s death brings an end to the Victorian era, Sherlock Holmes is invited to investigate an apparent vendetta against a young woman in Surrey. He and Dr Watson have often visited the county, but the scene of the attacks is an area even more familiar to a certain Arthur Conan Doyle, who in 1897 had moved his family from London to a small town near Haslemere, in an area already popular among writers and artists. Rumours of ghosts and occult rituals add an extra frisson to the atmosphere of mystery and suspense as the screw gradually, remorselessly tightens. And as a nice bonus we meet an old friend, the one police detective who is undeniably on the same level as Holmes himself. Capital! This is the startling question that Jeff Cody and his wife, Lynda, hear during a wedding reception on the first night of the QueenCon mystery conference in Cincinnati. Not only are the whispered words unnerving, there is no one nearby to have spoken them. Jeff’s brother-in-law, mystery writer and amateur sleuth Sebastian McCabe, discounts the puzzle with what seems to be a logical and reassuring explanation. 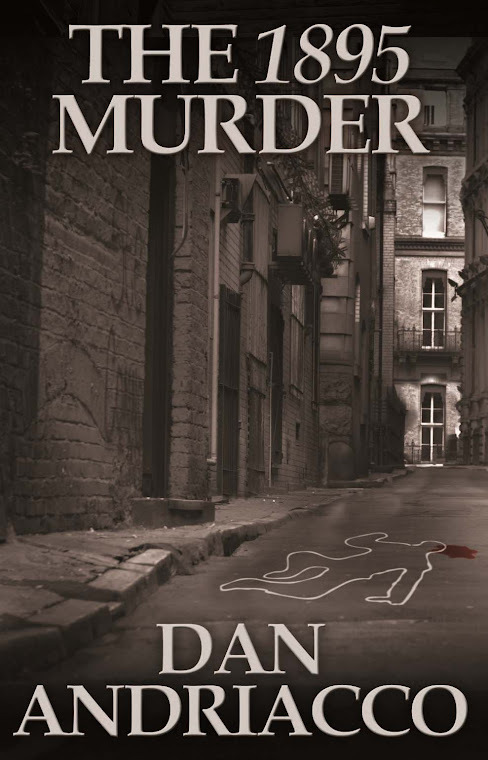 But murder does come to QueenCon – and to a victim who seems to make no sense. Mac’s usual freewheeling style of mystery-solving runs into a roadblock in the form of a homicide captain who has been his enemy since the seventh grade. So Jeff and Lynda wind up doing his legwork, and what they had expected to be a fun weekend is harder than any day at the office. 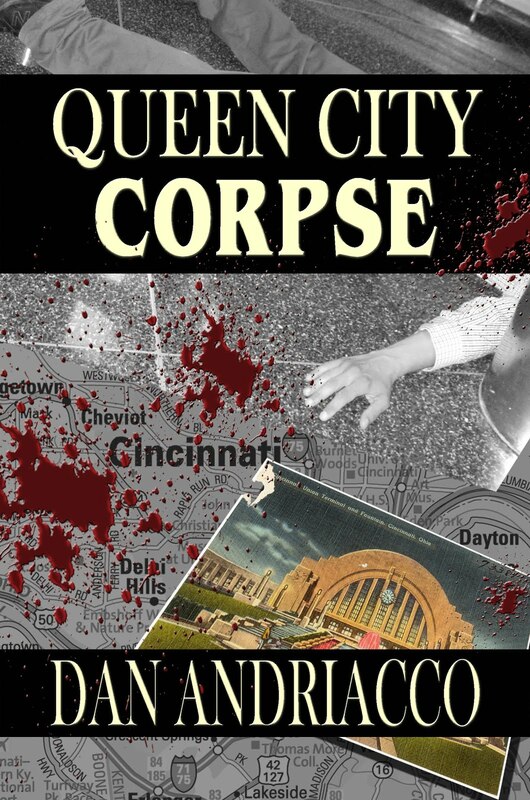 Queen City Corpse is available in all the usual places, including Amazon. Buy it now! When Erin, Ohio native Jamie Ellicott returns home as best-selling author James Ivanhoe after a 13-year absence, it’s like the return of the Prodigal Son. His ill and aging father welcomes him with open arms. Ivanhoe’s two brothers, however, are less forgiving. The whole town gets drawn into the family drama when Ivanhoe seeks to march in the annual St. Patrick’s Day parade under the banner of an anti-technology group called the Ned Ludd Society. That’s a thumb in the collective eye of his siblings, who own a company that makes microcircuits. As a member of the parade committee, St. Benignus University communications director Jeff Cody has a stake in what soon becomes a heated national debate. But to his genius brother-in-law Sebastian McCabe, the contretemps becomes less important than investigating murder in the Ellicott family. Bookmarked for Murder is a real cracker. Not that I expected less! I love a good fair-play detective story, a mystery that baffles so that I'm desperate to know the solution - and the solution when it's explained is both surprising and satisfying. Dan Andriacco gives us that, but he goes one better. I read on, not just because I want to know who killed the proprietor of the only used-book store in Erin, Ohio (bashed over the head with a replica of the Maltese Falcon), who has been peddling drugs to the athletes at St Benignus College, and who has been posting controversial footage of one of a history professor on YouTube. I read on because I like the sharp-witted, humane narrator, Jeff Cody, and his brother-in-law, Professor Sebastian McCabe - magician, detective-story writer, and formidable amateur sleuth. If Cody is Watson, McCabe is perhaps less Sherlock Holmes than a sort of sociable Mycroft. This is excellent, intelligent entertainment. London, 1924: When Alfie Barrington is stabbed to death outside his club, suspicion quickly falls on his widow, the lovely Sarah – and on her former beau, Enoch Hale. The American journalist has an alibi, but he doesn’t know her name and Scotland Yard can’t find her. Determined to solve this case without the help of his friend Sherlock Holmes, Hale launches and investigation that brings him into contact with Leonard and Virginia Woolf, bohemian writers and publishers; P.G. Wodehouse, creator of Jeeves and Bertie Wooster; Howard Carter, discoverer of King Tut’s tomb; and one of the greatest mystery writers of all time. 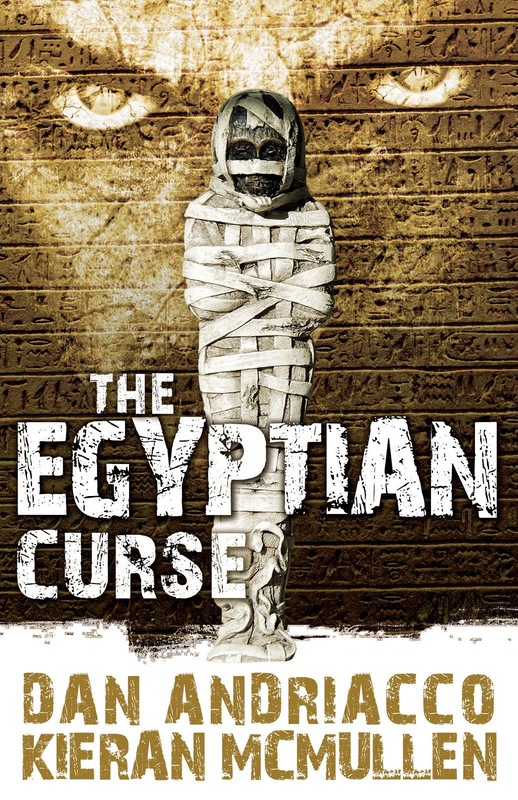 A second murder sparks journalistic speculation of a curse related to Alfie’s time in Egypt as a competitor of Carter and his patron, Lord Carnarvon. Hale doesn’t buy that, but he doesn’t come up with a better solution until it is almost too late. And in the end, it is once again Sherlock Holmes who puts it all together. 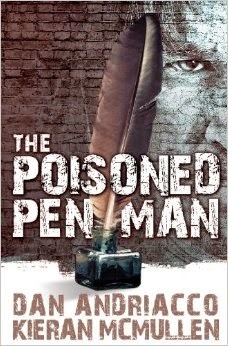 This exciting historical mystery concludes the Enoch Hale – Sherlock Holmes trilogy that began with The Amateur Executioner and continued with The Poisoned Penman. Reviewer Katie Magnusson called it "an engaging mystery." 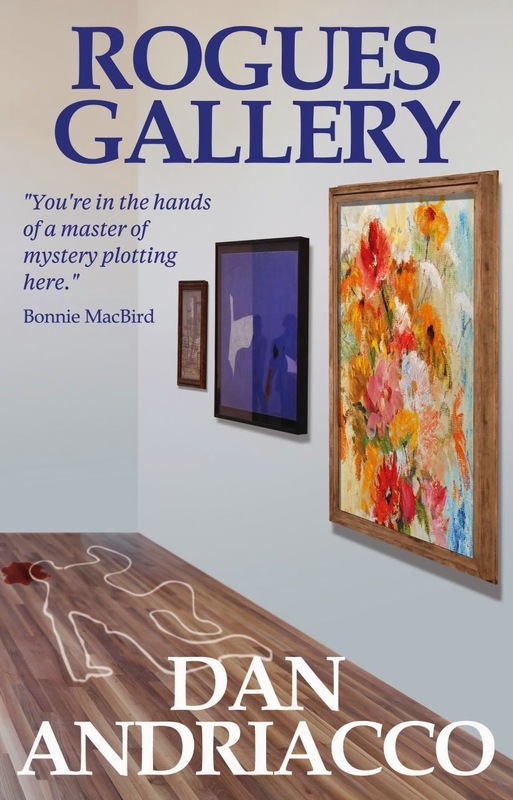 Dan Andriacco hits it out of the park with Rogues Gallery, a collection of short mystery stories featuring the two unlikely brothers-in-law and modern day Holmes and Watson of Sebastian McCabe and Jeff Cody. Narrator Cody is a sardonic, witty newlywed everyman while McCabe (rotund in the tradition of Nero Wolfe) is an avid, oddball Sherlockian with formidable powers of his own. Andriacco’s distinctive tone delights – in a similar manner to the brilliant M.C.Beaton – with his combination of cozy, small town detail and hilarious and pointed observations of its denizens. The cozy elements are all in the settings, here including an all-female art show, Christmas and Halloween parties, college politics and the developing relations of Cody and his new bride as they navigate newlywed issues. But unlike many mysteries with cozy elements, Andriacco’s plots are masterful. Like a skilled close-up magician, Andriacco lulls you into what appears to be quiet Midwestern sense of normalcy, only to turn up an ace from his sleeve with a murderous surprise. You’re in the hands of a master of mystery plotting here. Rogues Gallery is a delightful read, hard to put down, and highly recommended. And did I say fun? London, 1922: Two years after helping Sherlock Holmes solve the Hangman Murders, American journalist Enoch Hale becomes even more intimately involved in another puzzling mystery. Langdale Pike, veteran purveyor of gossip to the trash newspapers, is poisoned while sipping tea with Hale – and apparently just as he is about to spill a secret more important than social gossip. With the unrequested aid of advertising copywriter Dorothy Sayers, Hale pursues a number of leads based on notes in Pike’s pocket diary – including an interview with the formidable G.K. Chesterton. Once again Enoch Hale and the theoretically retired but far from retiring Sherlock Holmes join forces to solve a crime that may have international complications. And this time Hale himself almost becomes a victim when he gets too close to the solution. The Baker Street Society says, "A first-rate pastiche, in fact it could scarcely be bettered. Short pastiches can be tricky things for writers to get right and indeed very few succeed wholly but here is one writer who does. Everything in this tale is spot-on. 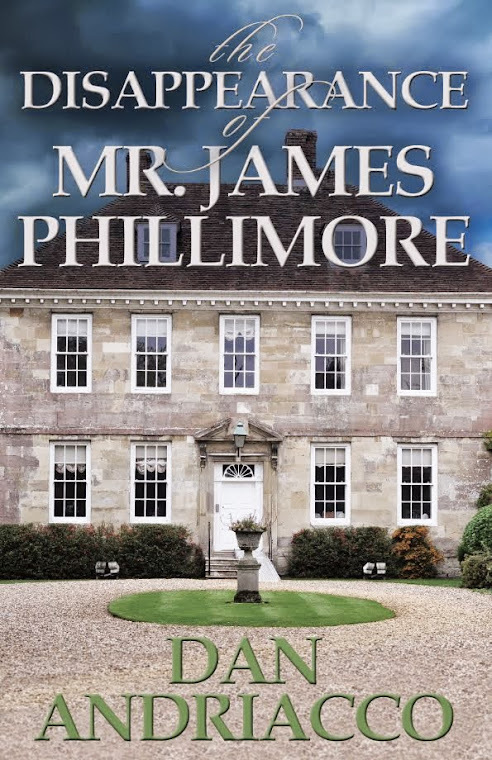 James Phillimore and his umbrella has been providing pastiche writers with rich pickings for years and exercising their collective imagination, but case closed, here is the definitive version." Author Mike Hogan adds, "Twists and turns abound in this intelligent and well-written short story. As we have come to expect from Mr Andriacco, the prose and characterisations are true to the original Conan-Doyle stories, the dialogue is authentic in tone, and the late-Victorian background is convincing." “Reading The 1895 Murder, the third mystery in Dan Andriacco’s Sebastian McCabe/Jeff Cody series was like visiting a group of friends who, yet again, find themselves embroiled in a murder investigation. Andriacco’s masterful plotting had me stumped. When book four comes out, I will be one of the first to crack the cover.” – Kathleen Kaska, author of the Sydney Lockhart mystery series and the Classic Triviography books. British reviewer Ross K gives The 1895 Murder five "Napoleons" out of a possible six! Watch his video review. Ross K. Foad's video review gives Holmes Sweet Holmes 5 1/2 "Napoleons" out of a possible 6! The Well-Read Sherlockian awards it 4 1/2 out of 5 stars in a detailed review! 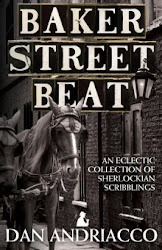 "The District Messenger," newsletter of the Sherlock Holmes Society of London, calls Baker Street Beat "a very pleasant book," and compares it to "chatting over a drink with a knowledgeable fellow Holmesian." Joe Revill, reviewing Baker Street Beat on his A Case of Witchcraft blog, also liked "The Wrong Cab" and "Reichenback Pilgrimage." 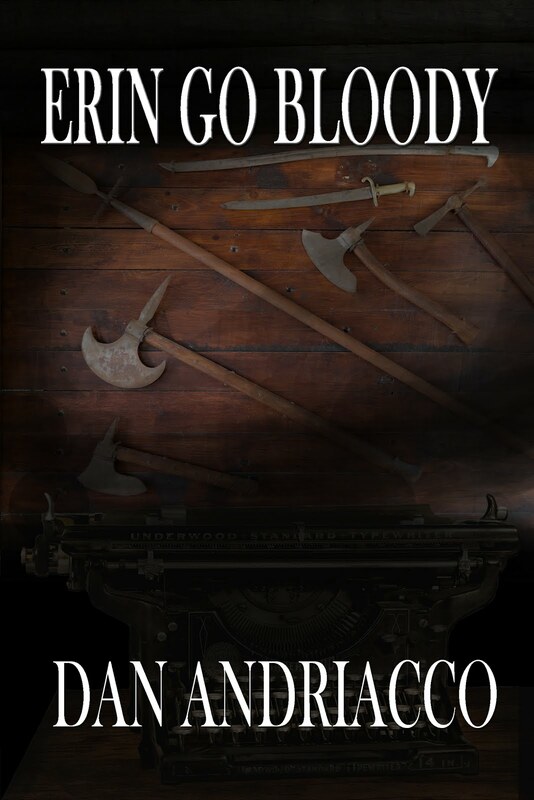 British video reviewer Ross K calls Dan Andriacco "a wonderful, creative, humorous writer." The website Cult Britannia calls Baker Street Beat "an entertaining collection" and concludes "I would definitely recommend this book for anyone who has a love of Holmes and wants to learn more about him." Roger Johnson, the reviewer for The District Messenger, newsletter of The Sherlock Holmes Society of London, calls No Police Like Holmes "an exciting and witty romp – not about Holmes but about his fans" and concludes "I like it!" A longer review by Sue Magee of The Bookbag, a British an online review service says in part: "It's a satirical look at Holmes and the industry he's spawned, but it's affectionate and neatly constructed . . . 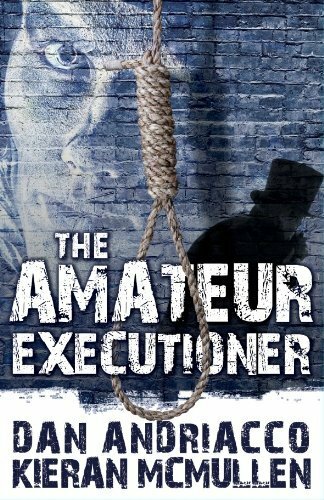 There are plenty of twists, a good few red herrings and an ending which surprised me as I had someone entirely different chalked in as the murderer." "No Police Like Holmes is a chocolate bar of a novel—delicious, addictive, and leaves a craving for more," says the blog Girl Meets Sherlock. "Holmesians of all tastes and ages will recognize themselves in Andriacco’s characters and enjoy his fast-paced plot. 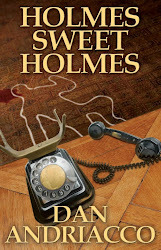 Thankfully, the series continues, and fans can satiate their desire for more with Andriacco’s next novel, Holmes Sweet Holmes." "No Police Like Holmes is a fun, literary read. In the hands of Andriacco, the above statement is not an oxymoron. Get this book, dive into a comfy chair, pour yourself a couple of fingers of scotch and enjoy this, sweetheart." So says Felicia Carparelli's Sherlock Holmes Murder Blog. But read the whole review! Felicia is no slouch at mystery writing herself, by the way. British video reviewer Ross K calls No Police Like Holmes "very, very funny." To Publisher's Weekly, the book is an "entertaining whodunit" and "Cody is engaging enough to make further books in the series welcome." 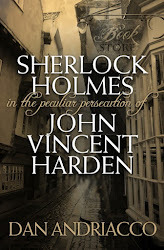 "Andriacco’s characters and their lives are so very normal and untormented, his writing style so light, and his observations so witty that No Police Like Holmes is an enjoyable, palate-cleansing romp of a mystery with a little Sherlockian education thrown in," advises The Well-Read Sherlockian. "Take it with you to the park or the beach and see if you can catch the culprit first!" 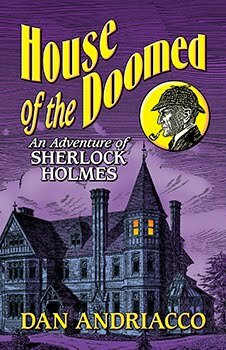 Felicia Carparelli's Sherlock Holmes Murder Blog calls this Sherlock Holmes pastiche "the closest in tone and content to a Holmes work that I have read in a long time." British reviewer Ross K gives it six "Napoleons" out of a possible six! 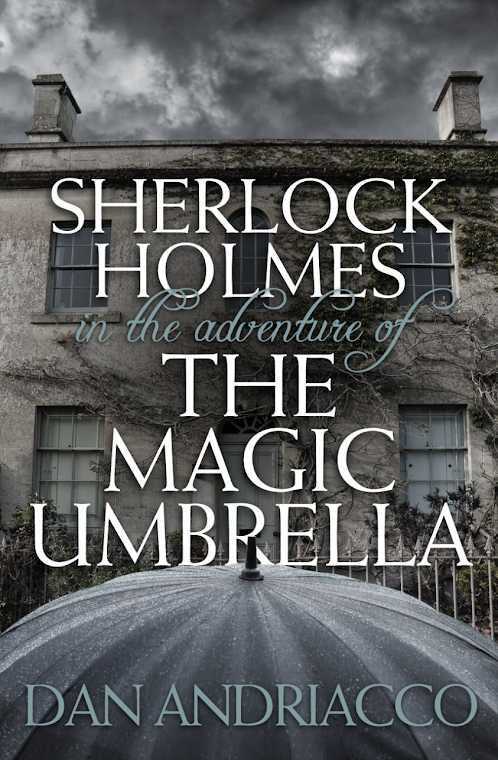 Charlotte Anne Walters hails the story as "a lesson in Holmes pastiche from a skillful and genuine fan." The link above is to the Amazon Kindle version, but "The Peculiar Persecution" is available in other e-book formats as well. The story also appears in Baker Street Beat. It's St. Patrick's Day in September! Mystery writer and commentator Dan Andriacco has been communications director of the Archdiocese of Cincinnati since 1997. However, his opinions expressed on this blog are his alone and not those of the Archdiocese.